Want to tone up in just 30 minutes per week? Our Kettlebell course burns fat FAST! 4 week kettlebell course suitable for all ages and abilities. 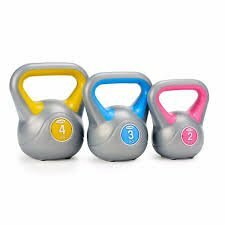 Kettlebells – think bowling ball with a handle – can seem intimidating if you’re unsure how to use them but incorporating them into your fitness routine can challenge your body and build strength, stamina, endurance and flexibility unlike any other piece of equipment. The functional movements that you perform with a kettlebell resemble movements that your body performs every day. Kettlebell training offers you the ability to burn fat and inches around the waist, thighs and arms. It provides a fun and exciting alternative to ‘normal’ workouts, increasing your metabolism which will result in a decrease of body fat percentage. Training with kettlebells is not designed to increase muscle mass but rather to build strength by increasing the amount of lean muscle tissue. Increasing lean muscle tissue results in strength without bulk and a lean-looking appearance. Kettlebells are effective at increasing strength by using full-body functional movements that incorporate several muscle groups for each exercise. Kettle bells are a great time saver when workouts need to be quick and intense by combining cardio, strength and flexibility. A typical session lasts just 30 minutes yet burns up to 600 calories. The ballistic, but non impact nature of kettlebell work is the key. Instead, kettlebell exercises actually strengthen your joints. Kettlebells start at 2kg. Kettlebells require you to engage the core in almost every lift. Kettlebells have a reputation for strengthening backs and abs like nothing else before. Kettlebell training is simple,fun and unique. The movements are easy to follow and the sessions are quick and enjoyable.